Compared with other California areas, Napa and Sonoma Counties may be a bit light on typical tourist attractions like amusement parks or museums, but they do offer oenological, culinary, artistic and natural delights that will stimulate your senses and soothe your soul. The California Wine Country map and information presented here will help orient you to the area and, it is hoped, help you make the most of your Wine Country visit. Front and center are the area’s wineries, but you can also think of the entire countryside as one gigantic attraction. Sometimes the simplest pleasures are the most rewarding – pack a picnic, rent a bike and drink in the surrounding beauty as you enjoy some wine. Even the sky’s not the limit here because you can also take a Wine Country hot air balloon ride to soak in the beauty from above! There is certainly no shortage of things to do in the California Wine Country, and as you will note on the main California Tourist Guide map there are also other areas nearby that you may want to visit while you are here. 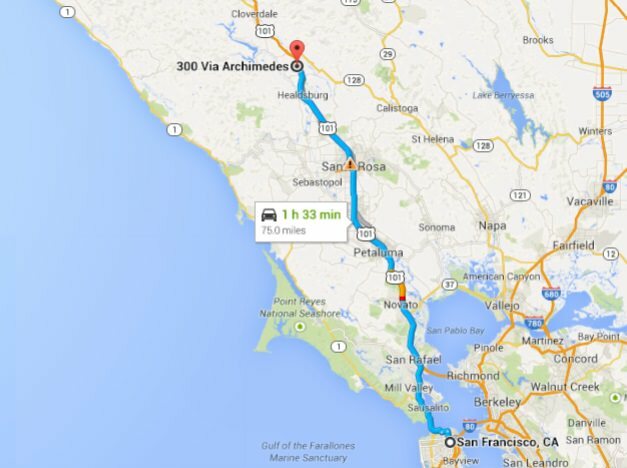 The distance from San Francisco to Napa is only 50 miles (80 kilometers), so you may also want to consider some Bay Area vacation ideas in your planning process. 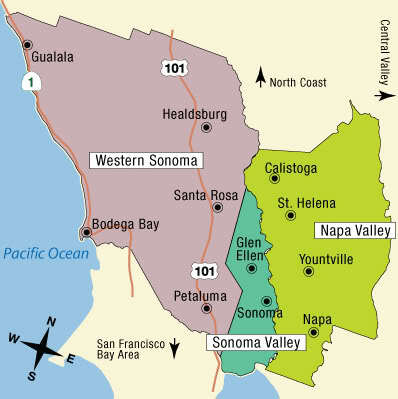 Since air transportation to the area is limited (Santa Rosa’s Charles M. Schultz Sonoma County airport is the only local option), most people travel to Wine Country from either San Francisco International, Oakland International or the Sacramento airport. As you can see on the portion of a Google map above, San Jose airport is also an option. Knowing and exploring all these options can often help you save on air travel costs.